About a month ago I suffered a serious lapse in judgment. 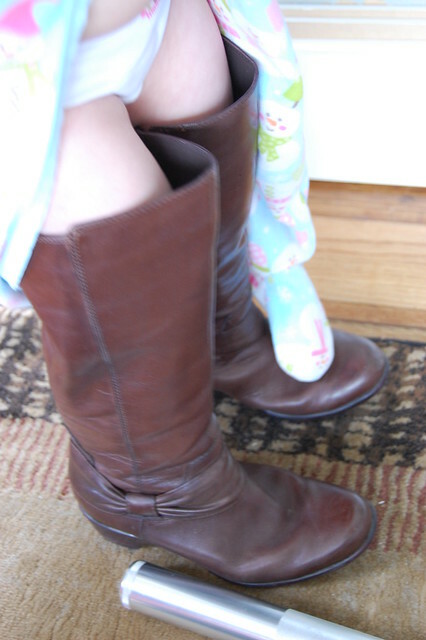 More specifically, tall leather boots. Fortunately, a few of you called me on my error and I am now here to make good. As you may recall, I was on the hunt for the perfect boot back in September. It was a search that I was not about to perform by going into actual stores on account of these athletic calves and my refusal to unsuccessfully zip up multiple pairs of boots over said calves while employees look on sympathetically. Uncomfortably? Empathetically? Unacceptable. Ly. I ordered two pairs of boots from Zappos giddy over the idea of free shipping (and free returns!) and they arrived at my door in approximately 30 minutes. Or so it seemed. I mean, they came ridiculously fast. * I contemplated ordering even more boots just to see how quickly they would arrive. And then I would return them all. FOR FREE! Oh to try on shoes in the comfort of my own home for the rest of my life with no commitment to purchase! Of course then I remembered that while the shipping is free, I would still have to package the shoes back up, load them into my car, and drive them to some sort of shipping facility. And even though I would have an entire year to do so, there is a definite possibility that I would never get around to returning any of the shoes and then Z-cakes wouldn't be able to go to college. So, you know. Boots! I ordered these and these. Miracle of miracles they both fit! I knew immediately I would not be keeping the Danskos because the lacing up the front, while making it so I could actually zip them up, only seemed to emphasize the (ahem) sheer athleticism of my calves. I ended up choosing the Clarks because: a) I could zip them up. Barely. And now, as you have seen, my boots are here to stay. The leather has stretched a bit as I had hoped it would so my feet don't fall asleep while I'm wearing them. Also! I can wear them over my skinny jeans and oh yes I have skinny jeans, and wouldn't you just love to hear about them? Z-cakes likes to slip them on when she goes hunting for the Big Bad Wolf. Along with unzipped footie jammie jams and her big girl roos. And a Maglite. And since I know some of you are going to ask, Z-cakes' underoos are from a new line by Michael Kors. No they're not, they're Minnie Mouse. They can be found (not exclusively) at Target. *Dear Zappos, If you're listening, you may pay me in boots. I like these. They are gorgeous!!!! I got a pair of clarks for Christmas. Love them a lot! I'm hoping mine stretch out a bit too. 1. I could never afford boots. 2. I could never (at least presently) wear skinny jeans, and so while I like boots, i don't think I could wear them. But then I thought- I could wear them with skirts and dresses! Wouldn't that be cute? But then I remembered #1 and how I can't even buy groceries this week. Sorry about that. It just had to come out. I'm glad you used accurate adjectives this time. YES, tell me about your skinny jeans...and also show me. Because I don't think I could do a skinny jean, and then I think,"I bet they would look cute with boots." And then I refuse to try anyway. Testify for me, sister! Contrats on your first typing of hullabaloo. Now that's what I call a big day. To celebrate you should buy me some boots. Oh have I said how much I love these boots before - or have I just done that in my head! Well I love them! I am afraid I have given up the hope of ever finding a pair to fit my athletic (oh I adore that saying now) calves. But maybe I should give home-shopping for them one last try. Thanks for the inspiration. Love. Also the ones you linked to. I'm pretty sure they don't make tall boots big enough to go around my calves, and I know I can't wear skinny jeans. Boo.